Today, I continue my series on percussion methods with cymbals. I will begin with concert crash cymbals and then discuss suspended cymbal. My discussion will be limited to concert instruments and applications, not drum kit. I have found the best sound can be produced using leather handles on the pair of crash cymbals. Handles that are held on with metal hardware inhibit vibration, and can damage the center of the instrument because the hardware holds the cymbal too tightly. Leather straps are readily available commercially, and are easily attached to the cymbals. If you are currently using handles, I suggest you remove them and replace them with leather straps. Here is a diagram of how to tie the straps onto the cymbal. 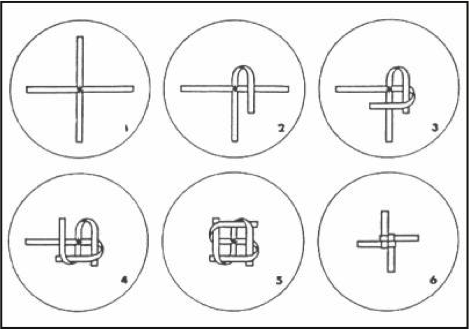 The square knot resulting from following these directions usually will not pull through, but if it does, place a penny inside the knot. How to tie a cymbal strap. To grasp the cymbal, hold the hand out as if you were going to shake someone’s hand, with the thumb on top. Leaving the thumb raised, grasp the outside of the loop with the remaining four fingers, then lower the thumb down on top of the strap. If a pad is used, the thumb can rest on the pad instead of the strap. The forefinger should be as close to the bell of the cymbal as possible in order to minimize movement and gain maximum control. The arms should support the cymbals in front of the middle of the players chest, and the edges of the cymbals should be about three inches from the player.The elbows should maintain a natural position; avoid tucking them into the body, or protruding them unnaturally away. Feet should be spread at shoulder width, one foot slightly further forward than the other, and body weight should be equally distributed between the two feet. The player should be standing straight while playing the cymbals. To produce the crash, two overriding principles must be observed: both cymbals must travel toward each other, and top and bottom must not contact each other at the same instant. The later is to avoid an air pocket from forming, which is the death of all cymbal crashes. For a right handed player, tilt the cymbals slightly to the right, separated by about four inches and parallel. Tilt the right cymbal slightly more, so that the bottom edge will contact the left cymbal before the top edge. Move both cymbals toward each other for a glancing blow. At contact, the wrists move as they do for a stroke with a drumstick. After impact continue moving the cymbals in the verticle direction they traveled approaching contact, and then turn the plates outward to project the remaining sound. For notes in fast succession, follow the same procedure, but with less of a follow through. The suspended cymbal should be mounted on a stand without rattles. Secure the cymbal to the stand using with the sleeve and felt washer. Omit the top felt for better sound. The wing nut should be screwed on only a few turns, leaving plenty of room between it and the cymbal bell. The only purpose the wing nut serves is to keep the cymbal from flying off the stand, and it is extremely unlikley that the cymbal will ever even bounce high enough to approach the wing nut. The playing surface of the cymbal has many different timbres. Generally, the cymbal will be more staccato and metallic toward the center, and more legato and sustained toward the edge. For this reason, rolls should be done at the edges, one mallet across the cymbal from the other. Single notes should be allowed to ring for the exact duration of the note value, them muffled by grasping the top and bottom of the cymbal at the edge with one hand, while striking the next note with the mallet in the other hand. When selecting which cymbals to use for suspended cymbals, keep in mind that pitch is determined by thickness, and volume is determined by size. A smaller thicker cymbal will sound lower than a larger thinner one. For most concert applications, I prefer thinner cymbals because of their higher pitch and more responsive rolls—the “whoosh factor.” Ride cymbals from drum kit setups tend to be thicker and less effective for many suspended cymbal band and wind ensemble parts. Ultimately, you and your players will make instrument decisions based on the sound you are going for.